My answer is more optimistic than you might think. Yes, protectionism is on the rise. But there are powerful counterforces out there. Most significantly, digitization is allowing one-on-one connections to proliferate across the globe. In my view, this is the new globalism. It is not being driven by corporations or governments, but by individuals. And it cannot be put back in the bottle. There is no denying that, despite unprecedented connectivity, the world’s nations appear to be turning inward. Since the recession, the world’s top 60 economies have adopted more than 7,000 protectionist trade measures. Many countries are reinforcing their physical borders. Nationalist political parties have gained ground around the world. 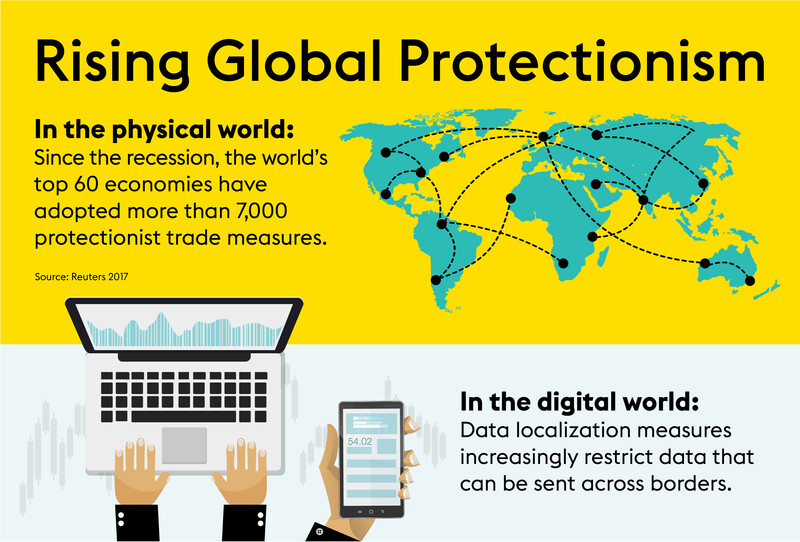 In addition to political nationalism, we are seeing the rise of digital protectionism. Borders are being erected even in the digital world, where countries try to restrict what data can be sent abroad. This trend is called “data localization” and it means that, rather than allowing data to flow freely across borders, companies are obliged to build mirror copies of the data they hold – with control in some countries passing directly to the local supervisory authorities. 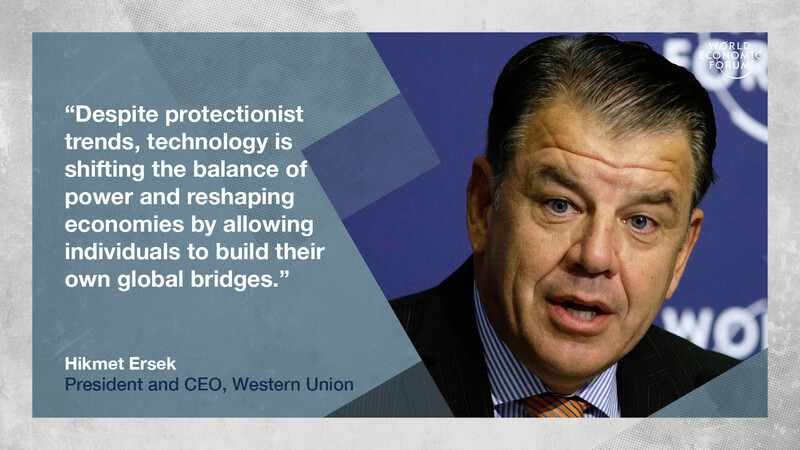 Yet despite these protectionist trends, technology is shifting the balance of power and reshaping economies by allowing individuals to build their own global bridges. McKinsey Global Institute’s work on digital globalization shows the way individuals are driving global connection by using digital platforms to connect with friends and family, seek degrees, find work and trade. Small businesses worldwide are becoming “micro-multinationals” by using digital platforms such as WU EDGE, eBay, Amazon and Alibaba to connect with customers and suppliers in other countries. And more than 900 million individuals have international connections on social media. To me, this is positive. I believe that when people are connected globally, good things happen. Part of the reason is practical: I believe that the big problems facing the world in the next few decades – inequality, climate change, unemployment, access to education and health – will not be solved by individual governments or organizations. They will require global teamwork. Part of my enthusiasm is personal. I have seen what global connections have done for my own life and those around me. I am the son of an Austrian-Catholic mother and a Turkish-Muslim father, and was raised in Istanbul, celebrating both Christmas and Eid. I went to university in Vienna, married an Indian-Austrian woman and now live in the US. Yet while I’m a champion of global connection, I believe it’s critical to shape the new globalism to be more inclusive. The truth is that, while technology is enabling individuals to participate directly in the global economy, there are still many people who are left out. Over the past few years, Western Union has been fostering new collaborations that ensure that the benefits of today’s global economy extend to all segments of society. As an example, Western Union recently announced a new payment option with Amazon that allows international customers to shop globally and pay locally – in-person, at Western Union agent locations in select countries – without requiring an internationally enabled credit or debit card. There are many underserved communities who want greater access to the product selection and competitive prices that e-commerce can offer, but paying for those purchases has been a real obstacle for people who prefer to pay in person or who are not comfortable using online payment methods. We are also powering Safaricom – a Kenyan company that has revolutionized financial inclusion with its e-wallet – to make it easier for individuals to send money from Kenya for pay-out across Western Union’s global network, opening up a world of connectivity across borders. Through collaboration, we’re enabling individuals and other businesses to move as easily between the digital and physical worlds of money as we do, using the combination of our iconic retail and fast-growing digital network. Such collaborations support global opportunity by connecting previously underserved communities to the networks that power the global economy, including commerce and payments. I’m optimistic that such initiatives will continue to shape a more inclusive and equitable globalism, bridge by global bridge. « What has a year of experiments taught us about basic income?